The Multi-CDN architecture, once an approach reserved only for the largest broadcasters and events, has gone mainstream. While this has happened quickly, its evolution is not surprising when considering the Content Delivery Network (CDN) industry and the world of video streaming. CDNs originated in the 1990’s as a response to a congested Internet and the need to come up with a better way to deliver Internet content. Over the years, the Internet grew and grew and so did its content delivery needs. Video streaming, however, has pushed CDNs to new bounds. Today, no one would argue with the statement that “Video is Eating the Internet”! Originally, big events pushed the Multi-CDN architecture to the forefront of the video streaming industry. During the Super Bowl, and other massive events, no single CDN offered the capacity necessary to reach all viewers. But, by putting a few CDNs together, you can handle significantly more traffic -- even if you still can’t handle anywhere near the number of concurrent viewers that TV reaches. This approach also offers the benefit of significant redundancy. Now, if one of your CDNs fails, your stream doesn’t just disappear because the other CDNs pick up the slack, making your entire system much more reliable. As the diagram above suggests, stitching together a Multi-CDN solution also diversifies your point-of-presence (PoP) map. Because no single CDN has servers deployed everywhere that your viewers are, you can work with multiple CDNs to achieve the geographic coverage that you’re looking for. By optimizing delivery for individual viewers, you can also significantly improve a stream’s QoS metrics. All of this has led to a huge Multi-CDN movement. Today, numerous companies, including Cedexis, Conviva and Nice People at Work all sell CDN load-balancing and performance measurement solutions that make deploying and operating a Multi-CDN solution fairly straightforward. However, the current generation of Multi-CDN architectures has not solved all of our issues. 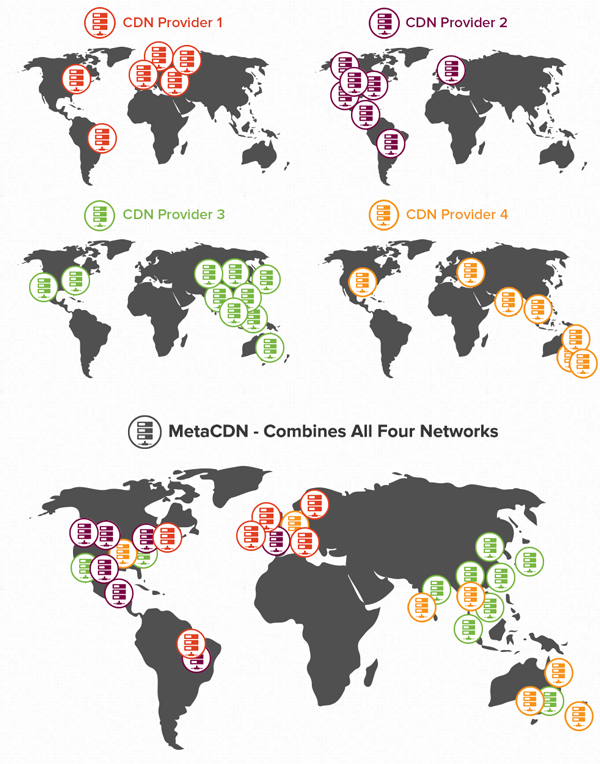 Though each CDN is different in many ways, they all still rely on a backbone of HTTP servers. This means that they’re more similar than they’re different. For example, a Multi-CDN setup improves scalability in general, but all server-based CDNs can still end up struggling as audience size grows. A Multi-CDN architecture can also improve geographic coverage and reliability in general, but only for locations where at least one of the individual CDNs has a PoP. This is where peer-to-peer (P2P) delivery becomes so valuable. A P2P CDN employs a completely different architecture than a traditional CDN such as Akamai or Level 3 -- one that relies on viewers, not HTTP servers. Instead of users consuming a server’s available bandwidth, viewers actually create more potential bandwidth. This means that a P2P CDN will perform its best during the periods of peak demand that cause HTTP CDNs to struggle. Geographically, a P2P CDN offers unparalleled coverage since wherever you have a viewer, you also have a PoP that strengthens your network. By utilizing both types of CDNs in combination, a hybrid Multi-CDN approach can significantly outperform a network that relies exclusively on HTTP-based CDNs. 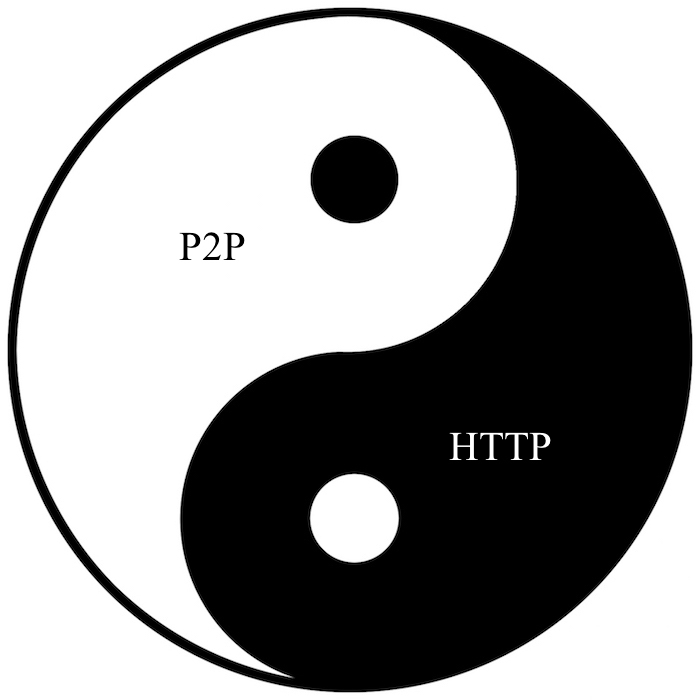 It’s precisely these differences that make HTTP and P2P CDNs the perfect complements for each other and a valuable part of any broadcaster’s Multi-CDN strategy. For example, for long tail viewing (thousands of videos being watched but only 5 viewers per video), traditional CDNs will shine. For heavily trafficked videos (with hundreds or thousands of concurrent viewers) however, a P2P CDN can significantly outperform HTTP delivery. Not only do opposites attract, they also create much stronger Multi-CDN video streams!